Rhubarb is the one perennial vegetable that needs no introduction. Everyone must have a patch in the corner of their garden, even if it was planted by their granny and hasn’t been used since. It is long-lived and practically bomb-proof and it just goes on and on. Most years my rhubarb patch doesn’t see a lot of use. One year I actually managed to set up a barter system with my local shop, swapping rhubarb and courgettes for bread, but then the ownership of the shop changed. More recently our community centre cafe has been using some of it, but I must confess to a bit of a history of neglect. Fortunately, neglect is exactly what rhubarb thrives on and it points up a general advantage of perennial veg: if you don’t use them then they can store up the resources and become stronger plants. The yield is not totally lost as it is with annual veg. This year, since so many of the fruits have done badly in the cold spring, I’m taking a little more interest in my rhubarb, so I called my mother, who is, in her own words, a ‘heavy user’ of the stuff. I remember most of her recipes from childhood: rhubarb crumble, rhubarb pies, rhubarb jams, rhubarb chutney and, best of all, a big stick of fresh rhubarb dipped in a bowl of sugar and eaten straight. There was even a surprisingly nice rhubarb wine. To this day I don’t like crumble, but the rhubarb pies were wonderful, especially when left for a couple of days and served cold, with the rhubarb juices soaked a way into the pastry. However, it was the jam I wanted to try, particularly one of my mum’s specialities, rhubarb and elderflower. Here’s the recipe (adapted a little to cater for my preference for less-sweet jams). 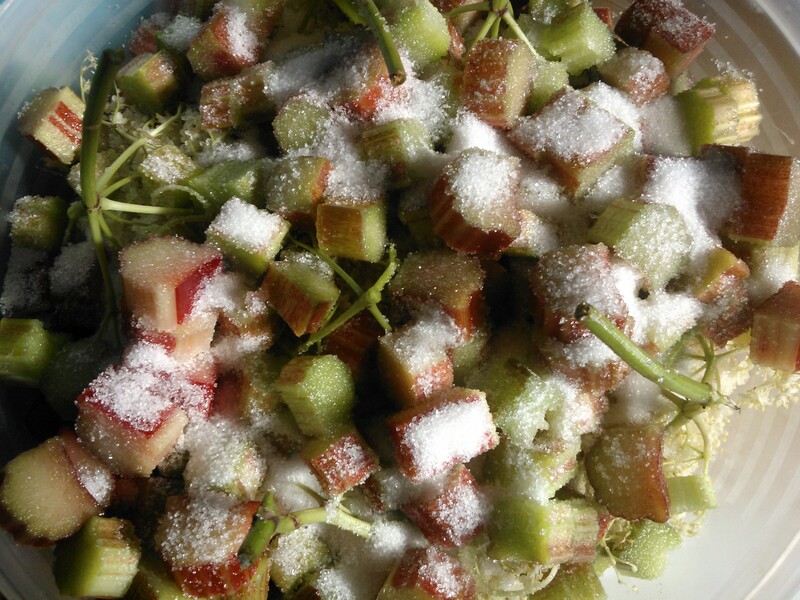 Wash the rhubarb stems and cut off the leaves and the stem bases. Cut them into chunks about 2 cm long (use a sharp knife or you’ll find you don’t get all the way through the skin). Put the chunks into a bowl in layers, adding a little sugar over each layer and putting in the elder flowers head-down before doing the last layer. Pour the rest of the sugar over the top and leave overnight. The next day you will find that the sugar has drawn the juice out of the rhubarb and the chunks are floating in syrup. Try not to let your children steal too many of these. Take the flowers out and steep them in water to make an instant cordial. Then boil up the jam in the usual way. Between the rhubarb and the lemon, this jam will set well so there is no need to overdo the cooking. As this is a low-sugar jam, it is best kept in the fridge once opened, but it will store quite happily for years unopened. For better storage once opened, use equal amounts of rhubarb and sugar. Elder is a tree with so many uses that I’ll have to give it a post of its own some day. It is so abundant that I prefer to forage it rather than have it take up space in my forest garden. I went down to our local park and selected ten choice blossoms; elder flowers have a rather nasty taste if you don’t get them at the right point, so each bloom got a sniff test to make sure it had that heady scent of summer. It’s the ones that look like they are almost over that are usually the best, not the pristine white new ones. 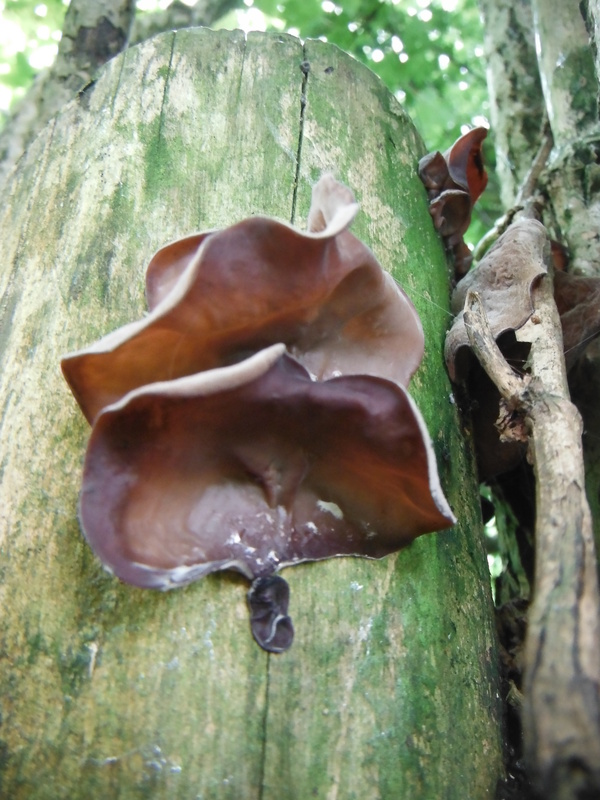 I also found a pleasant bonus while I was investigating the elders: they were full of jelly ear fungi (Auricularia auricula-judae, also known as Jews’ ears in a bit of traditional European prejudice). Jelly ears never found much favour in European cookery (one online description says that eating them is ‘like chewing on a piece of inner tube’) but Chinese cuisine has got a use for them: they are sliced thinly into stir fries to provide a mild flavour and a bit of a crunch. They can even be dried and rehydrated for the purpose. The scientific naming of rhubarb is a bit of a mess: you can choose between Rheum rhabarbarum, Rheum x hybridum or Rheum x cultorum. Rheum rhaponticum may refer to cultivated rhubarb or to another, closely related species. There are at least 2 other species of Rheum worth trying: Himalayan rhubarb (R. australe) is said to taste like apple and Chinese rhubarb or da huang (R. palmatum), like gooseberry. I’ve got both on order so I can let you know whether I agree. Technically, it isn’t the stem of rhubarb that we eat but the petiole, the leaf-stem. The true stem only comes later, when the rhubarb flowers. A persistent myth about rhubarb is that it is poisonous after flowering: perhaps this came about from people trying to eat the flowering stem rather than the petioles. The part that definitely is poisonous is the leaf and there is another myth which says that you shouldn’t put them on the compost heap as they will poison it. In fact the poisonous compound is an acid which quickly breaks down in compost and is then completely harmless. A little-known fact is that you can also eat the flowers of rhubarb. Rhubarb grows well in a forest garden. It doesn’t like full shade and shouldn’t be grown under another plant, but it is quite happy to be surrounded by taller plants which shade it for parts of the day. This entry was posted in Log, Recipes, Species and tagged cooking, elder flowers, forest garden, gardening, jam, plants, rheum rhabarbarum, rhubarb, scotland. Bookmark the permalink. This is a great post! I’ve always loved rhubarb and never even thought of combining it with elderberry flower!! Thanks for sharing. An interesting post, I’ll try the recipe next year when the elderflowers are out again. Trim and wash rhubarb. Cut into slices about 1″ thick and palce in basin. Cover with sugar and soak for 24 hours. Place in a preserving pan. Wash figs in warm water, dry and remove stalks then cut up. Add to rhubarb with the ginger, finely chopped. Stir over low heat until sugar is dissolved, then till boiling. Boil steadily for about 30 minutes on a medium heat till a little sets when tested. The combination of rhubarb ginger and figs is truly irresistible! Hi Jemima. Rhubarb and ginger is another one that my mum used to make, but I would never have thought of adding figs to it! Rhubarb also makes a very good vegetable-I have used it combined with duck and pork, and some Dutch friends told me they have it with mashed potatoes. I’ll try your elderflower combi next year as well as I’m hoping to have a glut of rhubarb having planted some new plants this year. Thanks Alan, love the idea of the jam with elderflowers-wish they weren’t all finished for this year but great idea for next summer. I have a question regarding growing rhubarb with other plants-have you ever noticed any negative effects? I am thinking most people have it in a patch on its own. Currently I have leeks and red russian kale in the same bad and neither look as good as the same plants elsewhere in the garden. I also had some new summer fruiting raspberry canes in this bit earlier this year which completely failed to grow. I’m keen to learn more about positive and negative polyculture combinations-especially the negatives as most books only talk about the positives. Hi Marlyn. That’s interesting about the kale since brassicas are the plants most consistently listed as benefiting from being planted with rhubarb. I’m always a bit wary of companion planting advice though, as there seems to be a very high ratio of hearsay to actual research and experience. In my own experience, I have rhubarb planted next to day lilies, Daubenton kale and blackcurrant and they all seem fine with it. Rhubarb is likely to be quite a heavy feeder so particularly if the plants are young they might just be outcompeting your other crops for water and nutrients.